Arab leaders have agreed a 29-item economic agenda in addition to encouraging the safe return of Syrian refugees to their homeland at the conclusion of the Arab Economic and Social Development Summit. 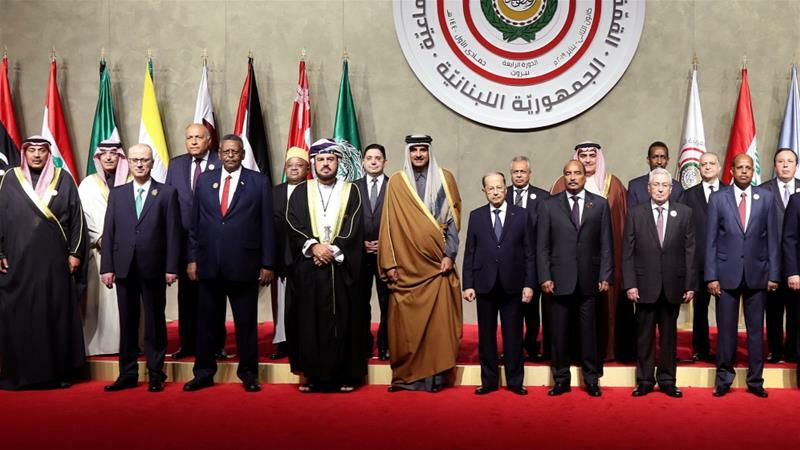 The 20 countries taking part in the summit issued a joint statement called the Beirut Declaration on Sunday, calling for the establishment of an Arab free trade zone and the international community to support countries hosting refugees and displaced people. Reading out the statement, Hossam Zaki, assistant secretary general of the Arab League, reminded the international and Arab donor communities to “help alleviate the suffering of refugees and displaced and to secure funding for developmental projects in host countries”. In his opening speech, Lebanon President Michel Aoun had called for encouraging the “safe return of displaced Syrians”, saying that the process should not be linked to a political solution in the war-torn country. A key point of contention ahead of the meeting related to the wording of Article 13 in the summit statement. Lebanon, which hosts hundreds of thousands of Syrian refugees, called for their return to Syria after President Bashar al-Assad regained control of most of the country. Other countries had insisted this discussion be linked to a political solution. The summit had also been marred by divisions among Lebanese politicians and regional leaders over the reinstatement of Syria into the 22-country Arab League. While Lebanon’s foreign minister Gebran Bassil called for Syria’s return to the bloc, its secretary general Ahmed Aboul Gheit said there was no agreement the proposal yet, adding that it may be discussed during the Arab League summit that takes place in Tunisia in March. Rami Khouri, a political analyst and fellow at Harvard Kennedy School told Al Jazeera that although normalisation with Syria was inevitable, the process of refugees’ return will take time. “There’s no sign of a serious breakthrough in a political transition which would allow the safe return of refugees and the reconstruction [of devastated areas]. For this to happen, there needs to be a clear sign for a political reconciliation according to UN resolutions,” said Khouri. Paul Salem, president of the Middle East Institute, agreed that normalisation will take time. “The trend is still toward normalisation, but some key Arab countries, as well as some in the West, will want to use the ‘carrot’ of normalisation to get some concessions from the Assad regime,” said Salem. Earlier in the day, President Aoun had presented an initiative to establish an Arab bank for reconstruction and development, which would help rebuild countries torn by conflict. Discussion during the summit focussed on redevelopment plans in Somalia and Yemen. The summit was overshadowed by political rifts. Lebanese media and analysts had called the meeting a “failure” due to poor attendance by Arab heads of state, many of whom pulled out last minute. In addition to a brief visit by Qatar’s Emir Sheikh Tamim bin Hamad Al Thani, Mauritania’s President Mohamed Ould Abdel Aziz was also in in attendance. “The Qataris are trying to promote a reconciliatory spirit around the region and reconfigure relationships following the siege,” Khouri told Al Jazeera. Amine Kammourieh, a Lebanese political analyst, said the “Emir’s attendance broke the siege imposed on the summit [by Arab leaders], saving it at the last minute”. A key contribution during Sunday’s meeting was the launch of a $200m technology investment fund across the region by Kuwait’s foreign minister. Sheikh Sabah al Khalid al Sabah said Kuwait would contribute $50m to the fund to allow “investment in the fields of technology and digital economy” which the private sector will take part in. Following the announcement, Qatar’s finance minister Ali Sharif al-Emadi pledged the same amount in support of Kuwait’s initiative. Speculations had circulated across Lebanese media on Saturday that Qatar would pledge coverage of all the summit’s costs as well as a deposit of $1bn in Lebanon’s Central Bank. But Bassil said those reports were rumours and aimed to create a let-down of the summit. The League’s secretary general Abul Gheit announced that the next Arab economic summit would be held in Mauritania’s capital Nouakchott in 2023, adding that the four-year break would provide time for the summit objectives to be achieved.